The famous videogame designer, Shigeru Miyamoto, known for creating some of the most iconic and successful videogames in history, such as Donkey Kong, Mario Brothers and Legend of Zelda, once said, "Videogames are bad for you? That's what they said about rock n' roll." In retrospect, we know rock 'n roll's influence has gone beyond creating a new kind of music, shaping many other aspects of culture: lifestyles, fashion, attitudes and language. And there is compelling evidence that rock 'n roll may have even helped the civil rights movement. In a similar fashion, videogames have been stigmatized by an older generation (that has largely never played them) as corrupting the moral and cognitive fiber of a generation. At best they can help develop some hand-eye coordination. At worst videogames can turn you into a sociopath. Because games are complex, you are continually reformulating and retesting your hypothesis -- the hallmark of critical thinking. But from what I've seen in my classroom, videogames aren't bad for you at all. In fact, videogames are powerful tools for learning. Take, for example, the game PeaceMaker, which I've integrated into my 7th grade history classes. PeaceMaker is a simulation of the Palestinian/Israeli conflict. Players play as either the Palestinian president or the Israeli prime minister -- under calm, tense or violent circumstances. Players have to make numerous decisions in the midst and wake of challenging circumstances and events, such as suicide bombings and missile strikes. When the players make decisions they are immediately assessed and converted into polls that show how the Palestinians, Israelis, Arab countries, Europeans, Americans and the United Nations think of their leadership. The goal is to make decisions that walk the middle path and reach peaceful consensus in the form of a two state solution. In the process of the gameplay, players learn to think like politicians and negotiators. The game requires taking a variety of constituencies into consideration when making decisions; otherwise their decisions would be too myopic. To create a peaceful solution requires reconciling polar worldviews, which means having a working knowledge of each extreme and a sense of which series of decisions can chart a middle way that unites both sides of the conflict. What makes PeaceMaker, and videogames in general, powerful tools for learning is that a variety of effective learning principles are embedded within the game design. While there is a spectrum of learning principles embedded within good game design, I've distilled the list down to five cornerstones. Videogames give you just enough information that you can usefully apply. You are not given information you'll need for level 8 at level 1, which can often be the case with schools that download files of information that are never applied. Videogames provide doable challenges that are constantly pushing the edge of a player's competence. This is similar to Russian psychologist Lev Vygotsky's Zone of Proximal Development. When you play videogames you're entering a virtual world with only the vaguest idea of what you are supposed to do. As a result, you need to explore the physics of the game and generate a hypothesis of how to navigate it. And then test it. Because games are complex, you are continually reformulating and retesting your hypothesis -- the hallmark of critical thinking. Cognitive science has recently discovered that memory is a residue of thought. So what you think about is what you remember. As videogames make you think, they also hold the potential to increase memory retention. Videogames are emotionally engaging. Brain research has revealed that emotional interest helps humans learn. Basically, we don't pay attention to boring things. The amygdala is the emotional center of the brain and also the gateway to learning. 5. We learn best through images. Vision is our most dominant sense, taking up half of our brain's resources. The more visual input, the more likely it is to be recognized and recalled. Videogames meet this learning principle in spades as interactive visual simulations. Videogames are emerging as a new gold standard of learning because they effectively integrate many vital learning principles into their design. Eric Hoffer, the San Francisco longshoreman and philosopher, said that "in times of change learners inherit the Earth while the learned find themselves equipped to deal with a world that no longer exists." We are living in such times of rapid changes, and those who are most adaptive not only survive, but thrive. 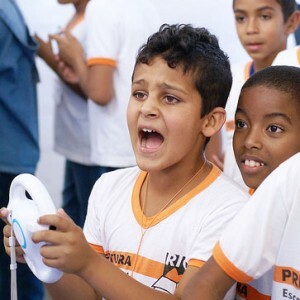 I believe videogames represent one of many new powerful forms of media that are tailored to our times, and can also be leveraged as a tool for learning that cultivates critical thinking and emotional engagement. Computers and videogames represent the latest possibility of turning swords into plowshares: The first computers were used for code-breaking and calculating ballistic trajectories during World War II. And now, with the right kind of scaffolding, hopefully we can use computers and computer games to connect, collaborate and create a more peaceful world.